A classic bridal portrait created at the bride’s home just before she leaves for church on the wedding day. Her hair and make up have been beautifully styled and her gorgeous bouquet of flowers has been delivered by her florist. She has stepped into her amazing wedding dress and is ready to head to her wedding ceremony, walk up the aisle of church and have her groom see her for the first time in her designer bridal gown. Before that, however, is one of the most exciting, fun parts of the wedding day. Being at home with her parents, her maid of honor, her bridesmaids and her little flower girls; taking those all-important portraits of the most precious people in her life that have been chosen to share in all of the joy of the wedding day. As a photographer this is one of my favorite times of the day. The anticipation and the excitement run at high levels. Everyone is glowing and it becomes the most perfect time to create glamorous bridal portraits such as this one. 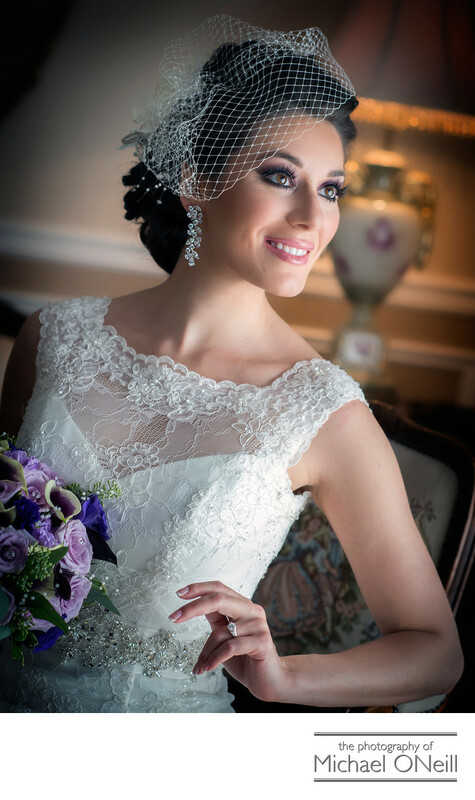 This photograph was made right in the bride’s living room using only the natural light that was streaming in through a large bay window in her home. I love using the natural, available window light in creating my portraits. It gives such a natural, yet flattering look to these most important wedding photos.